Every chef needs high quality knives, whether you're a chef in a nice Bistro, in a big hotel kitchen or you're an ambitious amateur in your own kitchen. 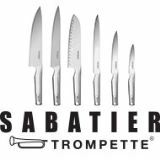 Sabatier Trompette offers every chef, big or small, a good set of knives. We believe every knife should be of high quality: whether it is a professional chef knife, a carving fork, a paring knife or a boning knife, every Sabattier Trompette knife is made of the best mix of materials. Ever since the 18th Century, Sabatier Trompette has evolved a range of knives that's grown to match their passion and dedication to the art of cooking. 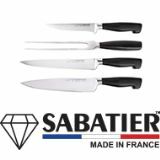 A brand with a real heritage, Sabatier Trompette can trace its origins back to early 18th Century Thiers, in the heart of France. 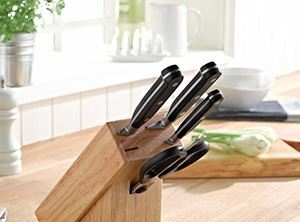 Every day, we shape the perfect tools for chefs, both professionals at work and passionate amateurs in their own homes. Inspired by modern cuisine and the demands of busy catering kitchens, Sabatier Trompette created several kitchen knife sets. Choose your favorite and enjoy the high quality which makes your food even more delicious. Find your set here.